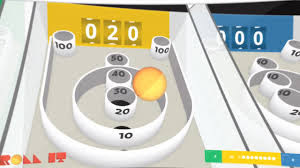 Google's new experiment called Roll It gives you chance to play a arcade game called Skee. And the requirements are rather simple and free. All you need is a smartphone and a PC with Chrome browser installed and you are on! The games allows you to pit yourself against two other players. The aim of Skee is to roll the ball into an inclined lane in order to make them fall into holes that have points. The holes further away have the most points while the ones closer and easier to target have fewer points. Try this new game by heading out to Roll It on your PC and generating a code. After you get the code, start Chrome on your mobiles and head over to g.co/rollit. Pair your friends phone and tilt the phone to choose number of players you want to play against. Done that, now to play you need to aim from your phone and then swing it in order to aim. The game guarantees a few fun hours on a boring day indoors with a couple of friends. Unlike most other Chrome Experiment games, you can play this game solo also. This is the second game in succession to Racer that Google has released after its Google I/O. Do post in your comments.